Ravenous Games' latest Android mobile game is Infestor. Another pixel-art retro platforming-puzzler done with flair and brilliant game design. The game has the same appearance and difficulty as their Random Heroes and League of Evil series', which is a great thing. What Infestor has done with this new game is more akin to their game Gravity Duck as opposed to the other more action oriented titles Ravenous is known for. It focuses more on using the role of a mind-controlling bio-weapon slime escaping a military facility- forcing players to solve puzzles instead of resorting brute force to get through levels. The levels are puzzles gradually getting more complex and difficult over time, filled with a variety of humans to take over in an effort to get through. Each of the human types has individual abilities, such as construction workers being able to push boxes around or a general being able to open locked doorways. Players must use each of the abilities to find an escape to the next level. Even abandoning a host is useful- when you leave them their head explodes in a humorous and satisfying splortch noise and gives you a nice jump boost to reach higher platforms. There's nothing too strenuous to solve, it is an even and well-balanced challenge growth through the game. The negatives of the game are small, nothing big enough to dissuade from giving the game a chance. 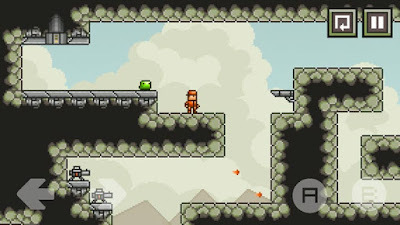 Players can get caught on parts of the landscape, occasionally the buttons will be unresponsive, and I noticed that any jumps that touch a wall or ceiling halt progress and drop you like a rock, usually resulting in failure of the level. But because the levels aren't very long, even towards the game, it isn't too much of a hassle- just a mild annoyance. Infestor is another entertaining game in the trademark Ravenous style. The threadbare plot is just enough, and it ends in a way that teases a potential sequel, that I will be eagerly awaiting.